Easter lunch is usually spent with my family and it is the first real catch up since Christmas, however it is much more relaxed. The weather is cooler and the days are shorter and it is a perfect time to just eat chocolate with a cup of coffee or hot chocolate (or glass of wine). My table setting reflects the changes in our seasons right now here in Australia, we still have wonderful Autumn colours everywhere, but there is also the natural and rustic winter tones coming through. I put a little chocolate hen in the middle of a nest that I made out of a mix of scraggly moss and this wonderful stuff from the garden and I then popped a few lovely bird feathers around the nest. I used a huge wicker vase to hold an enormous bunch of Babies Breath and I especially picked these bread rolls to match my setting as they had a earthy look to them. 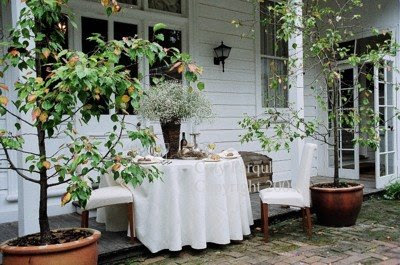 Don't forget to visit Susan from Between Naps on the Porch for many more wonderful table settings for Tablescape Thursday. 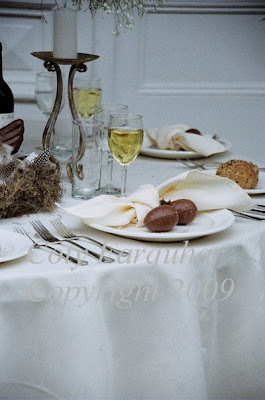 Susan has a gorgeous table setting near her window on a beautiful white wicker table. I always make it a point to look for your beautiful posts and photography. 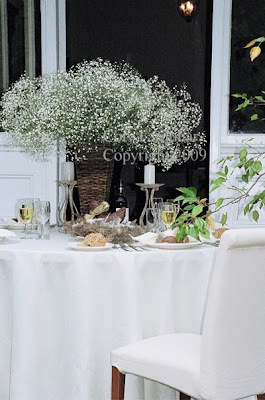 I love baby's breath--have never seen it really growing. Your patio looks so inviting! As always, jsut beautiful! I don't always comment but do enjoy seeing your beautiful posts via my feeds. Have a wonderful Easter. A beautiful table. Love those big pots with the trees -- they are amazing. What beautiful pictures. Thanks for your sweet comment this morning. It is going to be a wonderful day for us here. 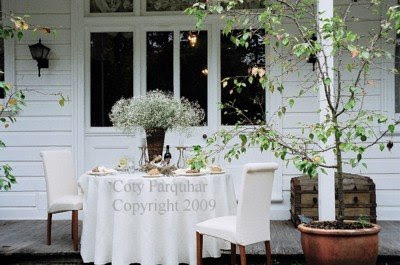 I would love to have lunch on the veranda, especially this one. 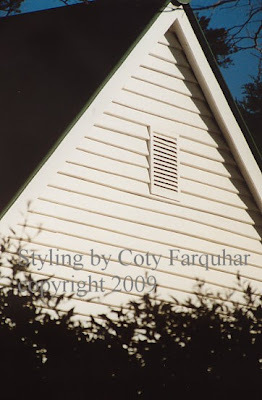 I love crisp white anything with pops of rustic brown. 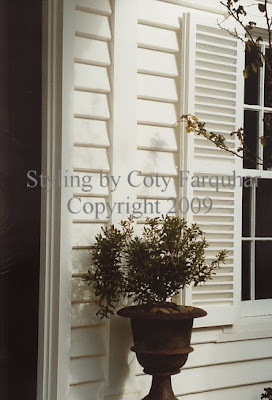 I just repainted our family living area, went crisp white on the walls and trim and brought in a beautifuly weathered wooden back of a french bench and hung it over the mantel. 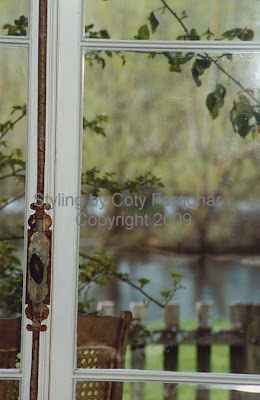 Along with moss, orchids, birdcage, and cloche....spring has sprung! Have a lovely day and always so great to hear from you. All your collections are good..
Oh, Coty, this is so lovely! 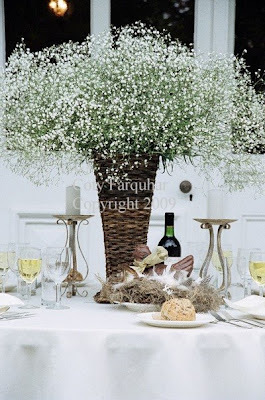 I like the baby's breath in the tall basket. It's such a great, airy and fresh look and is practical, too, in that you have all of the floral arrangement up above eye level for conversation. Of course, I've never let eye level bother me being a creature of impracticality. If I like it, it's on the table and people can just talk to their neighbors on either side. ;-) LOL! Your blog is such a visual treat. It always makes me happy to come here. So beautiful - As usual!! Your blog is like looking in a beautiful magazine - that I don't have to pay for - which is even nicer! Another lovely Coty table! Stunning! I would love to eat out on your veranda. I would absolutely love to sit there with a cup and enjoy the peace and serenity around me. Oh, how truly beautiful! This is just too pretty to be real - but I know it is! Did you do all of this gorgeousness? Stunning setting, so peaceful. Your photography is amazing, could look at it all day! Beautiful photos-makes me want to jump right into the scene! Can I tell you a secret? 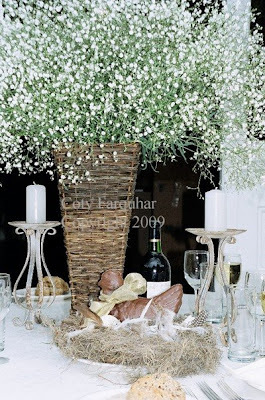 I always throw away the baby's breath when it comes mixed in a bouquet from the supermarket. But wow, it looks totally different when it is massed together! This is such a beautiful setting! 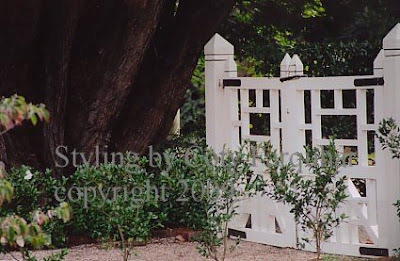 And your garden gate is to die for! 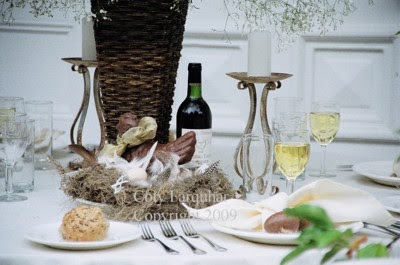 Love your Easter table! After Christmas, it was my grandmother's favorite table setting to create. Fond memories! Thank you for such wonderful and creative ideas! I am literally overwhelmed with all of your beautiful pictures. I mentioned you on my yesterday's post, if you'd like to have a look. Thank you again. LOVE LOVE LOVE your easter table!! Lovely! 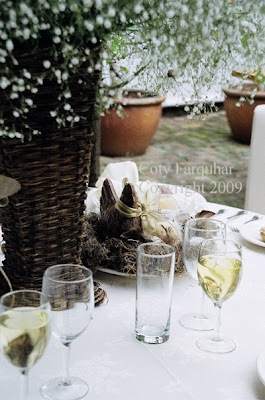 Such beautiful table setting - and full of peace and harmony. 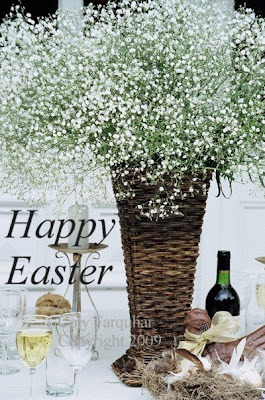 I wish you a nice Easter together with your family.